(The Biggie video is unrelated except I originally was going to start this post asking: “What Is Hype?” and this got stuck in my head). With the debacle that was the release of Founder’s Canadian Breakfast Stout back in October the long-running debates over allocations to retailers, the doling out to customers of rare beers and the pricing of said beers flamed up once again. One aspect of these debates that I believe never gets enough attention is the idea of Hype; that a breweries’ excitement over a product, along with the public’s rabid want of said product, creates an environment where the ideal is impossible and even the reasonable is less than likely. Here then, is one retailer’s take on Limited Beer Hype, and in a better world, where that hype would direct itself. I should start by saying I don’t mean to pound Founder’s or their distributors by using CBS as the example of Beer Hype gone amok. It’s just that the CBS release is the latest and in many ways the best example of issues within the Craft Beer community and business when it comes to releases like these. In my area (DC Metro; Northern VA, NoVA, the DMV) there were just under 60 cases of CBS to be doled out among hundreds of retailers and restaurants. From what intel I could gather, no one in the area got more than one case of CBS. Speaking only for myself this is a tough spot to be put in; my stores’ newsletter goes to thousands of customers every week, and here I am with 12 bottles to sell. It’s inherently going to be unfair to most people who want the beer. Some guys I know went to a lottery system to create a random chance for customers to get the beer. I like that idea; it’s a great way to not only be able to take a customer’s name (which gives them a tangible feeling that they may get their hands on something) but it eliminates the assumption many have that we as retailers hand out rarities to specific customers–a Beer Illuminati, if you will. Everyone thinks we do this, but the truth is not nearly as sinister. Speaking for myself, I can tell you that with quantities as low as they were with CBS and other beers of its type there is no Secret Society that just gets whatever comes in. It doesn’t hurt to know your beer guy, though–I did pull and hold one bottle of CBS, for a good customer who was out of town. Even then, I only did because he was coming back to town the day after the beer arrived, and I wanted to do him a solid. My solution, rather than a lottery (which I may go to in the future) was and usually is to simply say “First Come, First Served”. It’s fair but also proactive; how much do you really want that beer? Also, it brings people into the store and creates an environment where Beer Geeks get a chance to hang out and get to know their own kind. The day CBS arrived I had nearly a dozen guys hanging out in the store, having great conversations about beer that we frankly don’t get to have as often as we should. A lot of folks hate my use of First Come First Served, but I enjoy the environment it creates when a group of Beer Geeks come by to hang out so please forgive my little bit of social engineering. The point I was going to get to is that, using CBS as an example, Hype can and usually does create an environment where virtually no one is going to be left happy. Founder’s was justifiably excited over their beer–hell, they had a whole day-long event at their brewery the day it was released. On forums all over the internet, there was chatter and building excitement over the release–I had customers asking me about CBS back in July; well before I’d even gotten a tentative release date from Founder’s. Beer Advocate and RateBeer (even Untappd, which I enjoy thoroughly) ratings and reviews hold beers such as CBS out as Geek Bait, creating a myth and cultivating the idea of Craft Beer as Status Symbol. Founder’s reportedly made ~10,000 bottles of CBS. Mass disappointment was inevitable. So was retailers in some states gouging customers with the knowledge of CBS’s rarity (for the record, no one in VA that I know of did anything like that–there’s so little to go around that there was no point in gouging). The only thing Founder’s could have done, in my opinion, is release more to the greater U.S. rather than keep so much in Michigan. Then again, I’ve heard wildly varying accounts of how much CBS stayed in Founder’s home state, and even if they sent more out it would never be enough to even fractionally satisfy demand. A better example of this might be Bell’s HopSlam. Bell’s has admirably made more HopSlam available to us with every passing year, but the beer simply flies off of shelves. I appreciate the recognition of NoVA as a important market for HopSlam, but every year I hear about stores in Michigan buying huge quantities of it and even hoarding it to sell throughout the year–which goes against the entire idea of the beer as a “drink now while the hop is fresh” IPA. The bottom line is, while many limited releases will never be made in enough quantity to get into all of the hands that want them, a little extra would go a long way toward establishing faith in a brewery’s commitment to a market. Especially one as important as ours (shameless lobbying, I know–get over it; it’s my blog after all…). As a quick aside: Before you start to blame distributors (and Spaghetti Monster knows I do often and deservedly so), try to appreciate the position they’re in just a tiny bit. These limited run beers are often extremely pricy compared to regular stock; many distributors are still wine-oriented and relatively unfamiliar with Craft Beer so sometimes they shy away from bringing in as much of an item as they maybe should. Also, when they do it’s not unusual to see them selling more than they should to Big Box stores–again, these are businesses and they need to make their money where they can. All you can do, as a customer, is to encourage your local Independent Retailer to kick and scream and fight for every bottle they can get. Trust me, we’re trying: I can’t count the number of times I’ve heard of seasonals and limited beers being stacked in chains stores and telling distributors “I could have sold a palette or two of this, if only you’d let me”. Squeaky wheels get greased, folks. That brings me to us. The Beer Geeks. The people. What can we do about Hype? Well, what we can do is among the most difficult things to do in life; keep perspective. Understand that there are a great many things that are inherently unfair in this world and that being unfair does not necessarily make those things evil. I will use myself as an example: I’ve read about CBS for years. I’m a huge Founder’s fan and in particular the Breakfast Stout and its KBS variant. As a BeerAdvocate member since 2004, I’ve seen the Top 10 list evolve while only having opportunity to try maybe 10-20% of the beers that have made it over the past 7-8 years. I got 12 bottles of CBS into the store that I buy beers for, that I ordered for said store. And I didn’t get to try it. I didn’t sneak a bottle for myself. I didn’t get to catch it on tap in the area, or snag a bottle with dinner at one of the bars that had it. The thing is, though; I’m not in any way upset about that. I expected demand to be through the roof and supply to be microscopic. I accepted that I would likely not get enough to justify pulling a bottle for myself and decided it would have to wait for another day. News and rumors are flying about now about Westveleteren finally coming to the States in 2012. While yes, this may indeed signal the End Of Times, it is once again a beer that thousands will want deeply but only a handful will actually end up with. I’ve wanted to try Westy XII for years; to find out if it’s really The Best Beer In The World or just unobtainium in a bottle. But I know and accept that I likely won’t even see it. It’s ok, folks: As a rule, I encourage everyone not to get upset over anything that hasn’t been promised to them. So what of Hype? Well, I try to focus it on beers that I happen to fall for that I can also reliably stock for my customers. There’s nothing wrong with Hype as a concept: it’s the expression of an excitement for and belief in a beer and the desire for others to enjoy it as you do. I’ve Hyped the hell out of Schlafly since they arrived in the DC area about four years ago; finally this year we’ve seen a flood of new brews from them here and the public response has been excellent. 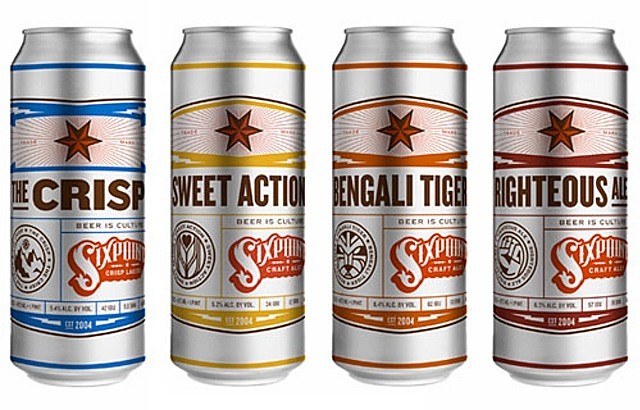 My current obsession is with Sixpoint: I’d heard many things about this brewery from Brooklyn over the past few years and was immediately excited when I heard they’d be arriving in VA this October. I went through the roof, however, when I got to try the beers out. They’re so focused and accessible, I saw a star in the making. Beyond that–tallboys! Who doesn’t like a tallboy can? Even their Cream Ale is outstanding! Sixpoint makes well-priced, complex, yet everyday-drinker-worthy Craft Beer of varying styles; that’s the kind of beer I want to Hype up. That’s the kind of beer that lets me know the Craft Beer Revolution is spreading, and will only gain more support over time as Macro drinkers find more realistic alternatives. Anyone can be excited by CBS, or Westy XII, or Dark Lord. In my world, if you can’t get excited over Sixpoint’s Bengali Tiger or Righteous Ale, or Schlafly’s Kolsch, you’re just looking to show off. I know I’m thinking a bit too Utopian. I know the Craft Beer scene is not going to suddenly go Zen and accept that which is unchangeable and unfair. I don’t even expect myself to be that way all the time: Who among us doesn’t love trying new things; rare things? There’s a place for all of it is what I’m saying. And what a brewery like Sixpoint can give you with their everyday brilliance is hope–hope for a coming day where all shelves are fresh and local and true. Where there is no longer any misconception about Craft Beer being a luxury. The CBS’s of the world get lots of attention, but they’re not the front line in spreading the word. The Crisp, however, is. Think it over, and remember: I and every retailer out there (I hope) am here to do everything I can to get my customers what they want. I stand to gain nothing but resentment and loss of business by screwing anyone out of anything. Most often, I’m in the same boat you are as far as wanting something we can’t get or can’t get enough of. Only together can we raise our voices loud enough to be heard, and for us all to someday, finally, be happy. Good day, and good hunting, everyone. This entry was posted in Rants, Retail Stuff. Bookmark the permalink.